It was easy to stick to a Primal diet. I did treat myself to a couple hot toddies made with bourbon, chai and a touch of honey. They weren’t that sweet, actually. They mainly tasted like bourbon, which I like better than tea. The foie gras starter that we shared was amazing. 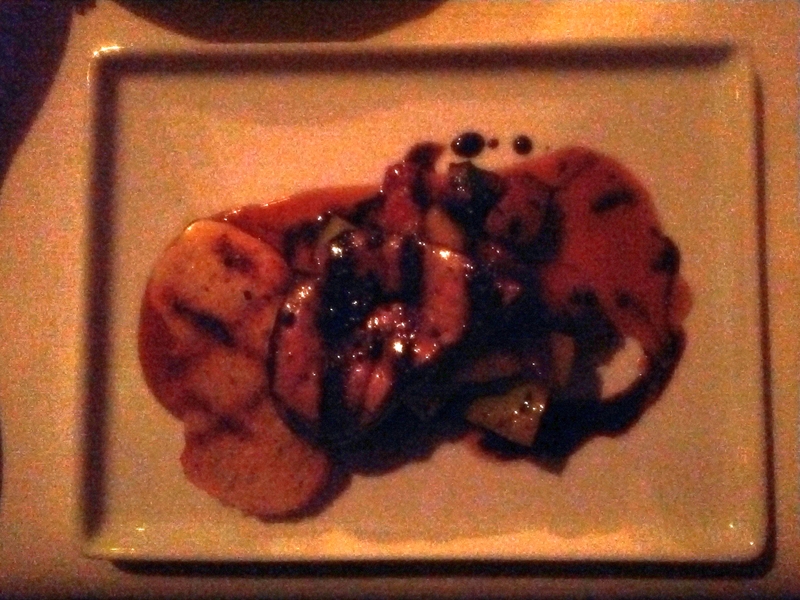 It was served with bacon lardons and green apples and topped with a 50 year-old Balsamic. Yum! Tom had never eaten foie gras before, but I told him that if he liked liverwurst and Vienna sausage he would like foie gras. It had a smooth melt-in-the-mouth texture. I would have been happy with this as my entree. 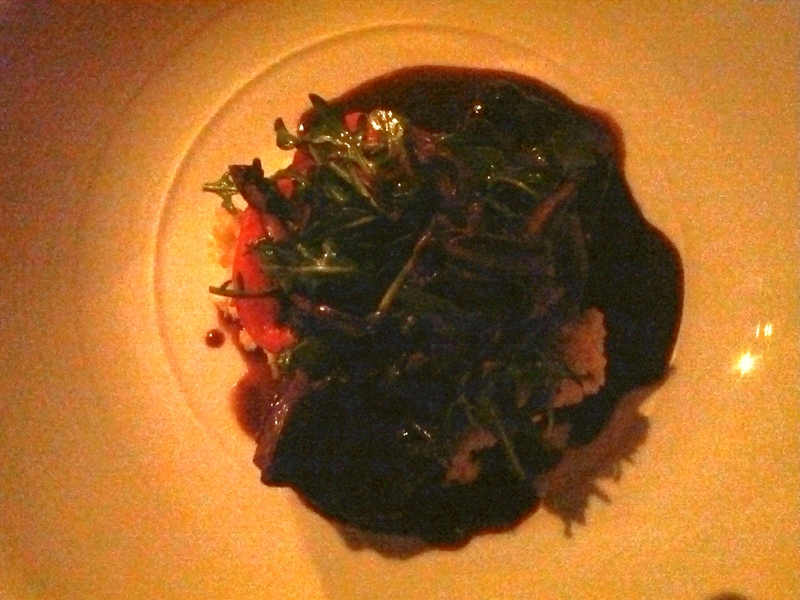 Tom ordered the short ribs, which are served over grits. This is what I usually order when I attend a pharmaceutical dinner at Cotton Row. This picture doesn’t remotely do this dish justice. The ribs are falling-off-the-bone tender. I describe this as tasting like the best pot roast ever. I ordered the duck breast, which is my go-to dish at a fine-dining restaurant. There are a few meals which I have intentionally never tried to perfect at home, and duck breast is one of them, not that it is widely available at the grocery store anyway. Again, the picture really can’t do it justice. The mysterious object in the middle of the plate is braised endive. The other reason I was drawn to this choice is that it came with several vegetables: there were sweet potatoes and Brussels sprouts on the plate as well. The duck was tender with a crisp but delicate skin. 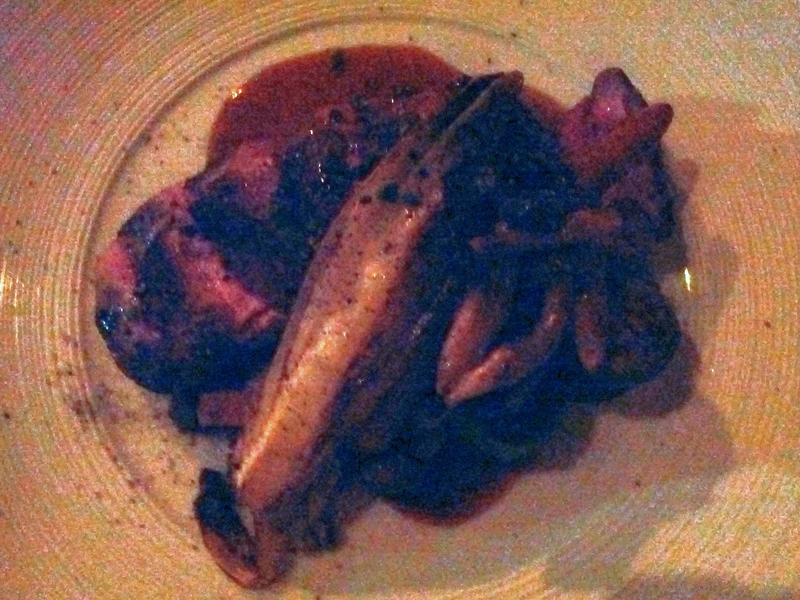 The port-cardamom sauce was a sweet but not sugary complement to the duck. Service was attentive without being annoying. Our water glasses were consistently refilled, and our dishes were removed promptly but not hurriedly. The food arrived sooner than I expected. My only complaint is that we ordered second drinks to arrive with the meal, but they did not arrive until after the meal. Since we were not in a hurry it was not a big deal. We did not have any room for dessert, so I did not get a chance to try the cheese plate I had been eying. Overall we were pleased with our experience at Cotton Row. Well this was a total fail again. I couldn’t even make it to bedtime Friday night. I did manage to shower Saturday morning before I absolutely had to eat breakfast. I needed to go into the hospital, and I didn’t think it was the best plan to see patients and possibly draw blood on an empty stomach! I’ve been eating 6x/day since I was 16 years old. I’m not sure that I’m ever going to manage fasting. Comments: I had limited time to exercise on Saturday, so I swapped Saturday and Sunday’s workouts. Disciplining my use of e-mail. It was nice. The next time we go when we call in our reservation I will specifically say I don’t want the table in the corner by the spiral staircase and that we prefer privacy.